Luis Ceze, Associate Professor, joined the Computer Science and Engineering faculty in 2007. He holds the Torode Family Career Development Professor endowed chair. 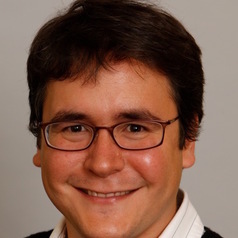 His research focuses on the intersection of computer architecture, programming languages and operating systems (see the SAMPA research group). He recently started exploring using biology to make better computers (see the MISL page). Visit his other other webpage. His CV is available here. He has several papers selected as IEEE Micro Top Picks and CACM research Highlights. He participated in the Blue Gene, Cyclops, and PERCS projects at IBM. He is a recipient of an NSF CAREER Award, a Sloan Research Fellowship and a Microsoft Research Faculty Fellowship, and the 2013 IEEE TCCA Young Computer Architect Award. He is also a member of the DARPA ISAT advisory group. His research is generously supported by Microsoft, Intel, Google, NetApp, Qualcomm, NSF, and the Pacific Northwest National Laboratory. He is a PI in the Center for Future Architectures Research. He was born in São Paulo, Brazil, where it drizzles all the time, just like Seattle. He received his Ph.D. in Computer Science from University of Illinois at Urbana-Champaign and his B.Eng. and M.Eng. in Electrical Engineering from University of São Paulo, Brazil. In his "free" time, he is often seen eating and cooking. Take a look at the collectively written white-paper on 21st Century computer architecture research.